118. That is how many days I have until graduation! Today was my last first day of class. Since I have no plans to go to graduate school, this is it. This is the beginning of the end of college. I cannot believe how fast it has gone by. I know everyone says that... but seriously!? How is it possible that I am a last semester senior? How is it possible that I am about to graduate and join the "real world?" I can't believe how much has changed since freshmen year. Just 3 and half short years ago. This is me on the day I moved in to my dorm. 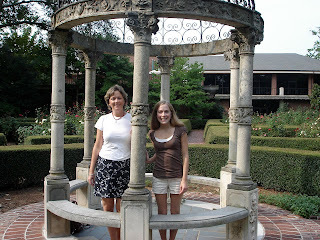 This is my mom and I on that day standing in the rose garden on campus. This is my roommate and I during Orientation Week. She is still one of my best friends. I have had some amazing memories at college but I know the good times wont end when I graduate! good luck on your last first week of a college semester! ahhh! I like the way you put that, "my last first day of class". Very clever. Enjoy your time with your friends as you wind down at school in the coming months. I love the photo of you and your friend during orientation. You're such a pretty girl.